See the cover of the brand new Diary of a Wimpy Kid book here at 5pm on May 1st 2018! OMG! We have something super cool to show you! It’s the cover of the brand new Diary of a Wimpy Kid book… But there’s just one problem. It’s encased in a huge block of ice! Sam and Mark are going to be hosting a special live video on Facebook on May 1st. 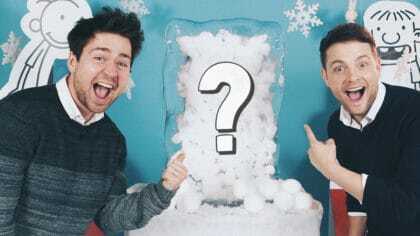 They’re going to melt, chip and blast the block of snow covered ice to reveal the cover hidden inside – the new Diary of a Wimpy Kid book! Of course, until then it’s TOP SECRET and it’s being protected by loads of guards and lazers and security people. The book’s written by Jeff Kinney, who wrote all of the other Diary of a Wimpy Kid books. It’s the thirteenth book in the series and follows on from Diary of a Wimpy Kid: The Getaway. The book’s due out later this year – but you’ll have to watch the Facebook Live to find out when! Don’t forget to check back at 5pm on May 1st to see what the new cover looks like!